"Why did I wait so long to take my first Advanced exam?" If you're afraid of the Advanced Level, we have great tips in this ASTQB Software Testing & Certification News from a test manager. "Why did I wait so long to take my first Advanced exam?" If you've been afraid to step up to the Advanced Level, we have some exceptionally helpful tips below from a test manager. Advance (Level) Your Way to Promotion - Why you shouldn't fear the Advanced Level exam, and why it can help your career. ASTQB Supports Local Quality Groups! See You at Upcoming Events! The sense of community among software testers was incredible at the ASTQB Summit that took place in Irvine, California. Attendees learned time-saving testing tips and made new connections that will help their careers for years to come. 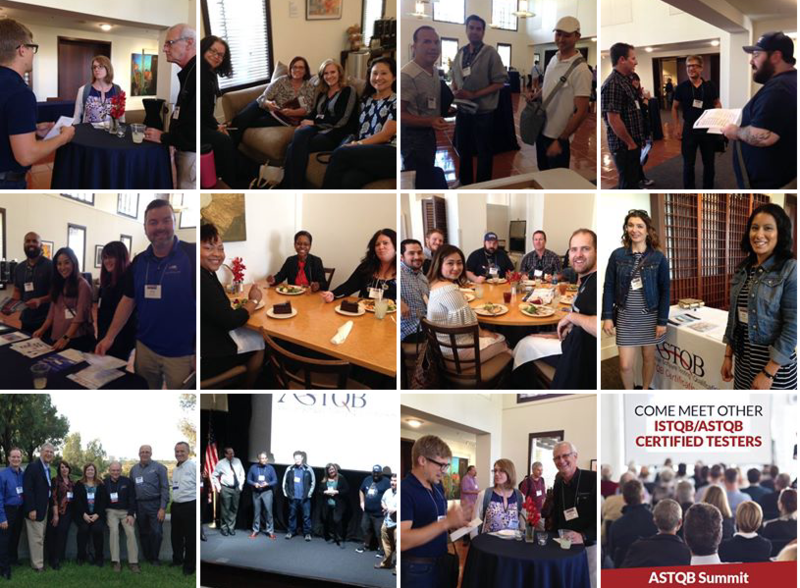 See the photos from the ASTQB Summit on the ASTQB Facebook page. To support local software testing and quality groups throughout the United States, ASTQB offers meeting sponsorships. Learn how your group can be sponsored. Why you shouldn't fear the Advanced Level exam, and why it can help your career. Editor’s Note: "Why did I wait so long to take my first Advanced exam?" That was the question Tom Adams asked himself after taking his first ISTQB Advanced Level certification exam. Tom credits ISTQB Advanced Level certification with helping him to become the test manager he is today. In our interview, Tom offered many helpful insights and tips regarding the Advanced Level exams. We have included a small portion of the discussion below, but strongly encourage you to listen to or read the entire Q&A session on the ASTQB website. The full interview includes additional exam prep and career tips. Why Is Advanced Level Good for Your Career? When I first came here, I was hired to be a test lead for our web enterprise and e-commerce side. But as I developed and got more certifications, they were like, "Well, maybe he could do this too." And so I took on more responsibilities and worked my way up, so that now I'm managing the test efforts for five major enterprise level areas that are critical areas: international, e-commerce, backend, database, middleware and different enterprise applications. All those come under my testing management and I don't know they would have felt as comfortable doing that, if I hadn't demonstrated I had the knowledge to do it. It wasn't like I got my certification and looked for a new job. I applied it to the job I had at hand. Why Shouldn't Someone Fear the Advanced Level Exam? I had my Foundation Level certification. But there was a reluctance to step out there and go after my first Advanced certification. I think it's kind of human nature. You say to yourself, "I'm doing okay now, do I really want to take that risk?" And so that first step broke the ice ... I went to training and I got my first Advanced. Then I realized it really wasn't that scary - it wasn't that bad. And so then I got my next one, and my next one. Looking back on it, you wonder, "Why did I wait so long to take my first Advanced exam?" Each person has their own things that they prioritized or that's going on in their head. So that was my personal obstacle. I really identify with people that are wondering about Advanced certification. Are the Advanced Level Exams Difficult? I really have two answers. The first answer is "Yes, they are difficult." But the second answer is "No, they're really not that difficult." And here's why you have two answers, it's sort of like luck: The people who prepare tend to be luckier than people who don't prepare. I would say, if you properly prepare for each one of the exams, you're going to walk in and you're going to say, "Why was I worried about this?" Because you know the material. The exams are just made to try to determine, "Have you learned the material?" Well if you learn the material, you're going to pass the exam. Then you're going to look back and go, "Well it wasn't that tough." But if you cram - you spend two days poring over the syllabus and then take the exam two days later - you may or may not pass. I'm going to say you probably won't pass. It's going to be incredibly difficult - because you didn't prepare for it. You didn't really study for it, you didn't really learn the material - you just crammed for it. I really think that's the core issue. We want the exams to be difficult in the sense that we want them to reflect an advanced level of of testing knowledge, right? So when an employer or somebody else looks at your ISTQB Advanced certification, they know that you know an advanced level of software testing. You bring that experience and knowledge to their business. We want them to feel comfortable and confident that this is meaningful. And we want your certification to be meaningful to you. So, it can't be easy and still be meaningful. On the other hand, we also want to be fair. There are no trick questions. It's just a matter of reflecting your knowledge of the areas. So, if you do a normal job studying and have some experience testing ... but, you don't have to be a 20 year expert to take the Advanced exam. So, if you've got your Foundation Level and you've spent three years of testing, and you prepare for the Advanced exam, you should have no problem passing it whatsoever. Should You Take A Software Testing Training Class? Editor's Note: In a previous ASTQB newsletter article Eileen Bluestein wrote, "I found that the interaction that comes with an instructor led course helps me learn material better." Eileen Bluestein is a credible source because of her certification in three Advanced Level and two Expert Level ISTQB certifications. In addition, she is certified in Foundation and Agile Levels. So we asked Tom what he thought about taking a training class instead of trying to self study. I totally agree and I think that in hindsight is very accurate. Like with my manager that I mentioned earlier, ("Well Tom, I'm going to sign you up for the training. But, you know you could pass that exam without taking a class."). Well, maybe... Of course I told him, "Yeah, of course!" - but I really wanted the training because he was more confident than I was at that time. But, I agree. For one thing, if you're taking the Advanced training, the people that you're going to be with are also people that are very experienced testers. And so you're going to be in a whole different group of people for three to four days, and really develop - as she said, camaraderie - and sharing and passing notes, and comparing experiences, and just informally building those relationships. And, as well, you can help each other study for the exam, and you're more motivated. I think it's a little more motivational. I think you absolutely benefit from that. In addition, the person who's going to be giving you your advanced class is also going to have a lot of additional insights and things, as he or she covers the material. And those too will help you not only pass the exam, but become more of an advanced level tester. And when you know what it says on paper - but it doesn't really translate into, "How does this work in the real world?" ... for example, in my Technical Test Analyst class, they had some very advanced concepts in terms of selecting data sets to test certain types of code. 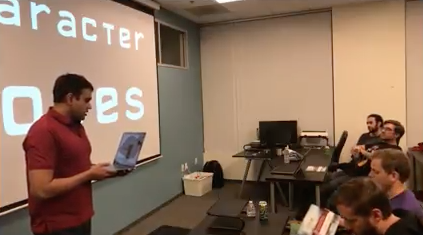 At one level, "Okay, I sort of get it," but at another level I really needed the instructor to demonstrate to me how this really works in the real world: "In real code, here's the kind of data we're going to use." And then it made sense, and then I understood it, and of course then I passed the test. But, yeah, there's definitely a benefit to having someone that you can - right on the spot - say, "I don't understand this, please go over it again." Whereas, if you're just sitting there, and you have the document on your own, you're going, "Well I don't really get it, but I have a 25 percent chance of getting it right on the exam anyway." Or you know - hopefully - the other questions will make up for it. That's not where you really want to be. You really want to understand the concepts, and I think being in the class really helps. So I would say, I encourage everyone to take a class. Not everyone has that opportunity, so if you don't have the opportunity to go, then self-study is what you have left. But, if you do have that opportunity, I do believe it's totally worth it. Yes. Read or listen to the entire interview to learn helpful studying tips, plus what Tom has to say about the importance of Agile and Mobile testing for your career. An ASTQB booth can be found at many software testing conferences and events throughout the year. Stop by and say "Hi!" to our volunteers and staff if you are there! We'll be at the PMI Global Conference in October, and Agile Dev, Better Software & DevOps in November (get a free expo pass for Nov. 9). 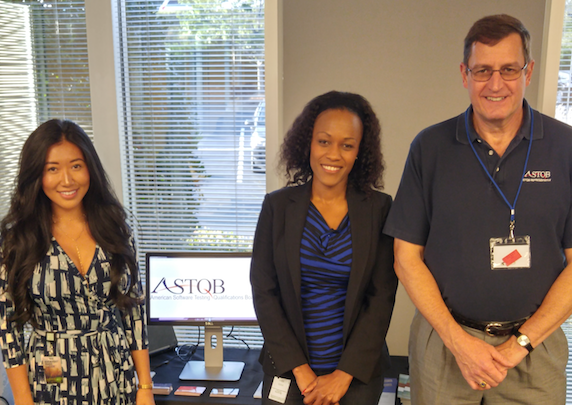 Former ASTQB President and ASTQB board member Rex Black with Nathalie Charlot and Helen Kim of the NCR Test Management Office (TMO), at the ASTQB booth at the NCR TMO Expo. ASTQB invites accredited course providers to include special offers for readers of ASTQB Certification News. You will find them below. SQE Training: SQE Training makes it easy to earn some of the industry's most sought-after certifications with Live Virtual Training. These live, instructor-led courses utilize leading technology to provide the benefits of classroom instruction without travel and time away from the office. For a limited time, get the training you need to reach your career goals and save 20% on select Live Virtual certification courses with promo code 20LVAS. Learn more and see eligible courses at sqetraining.com. *Restrictions apply, only valid on new registrations. RBCS: Need CTFL training? RBCS offers public training, virtual training and e-learning in addition to private training Contact us today! Rice Consulting Services: Rice Consulting Services is offering a 10% discount for registrations in the ISTQB Advanced Security Tester Certification e-Learning and upcoming Live Virtual courses. Use code "ISTQBSEC10" at https://www.mysoftwaretesting.com/category_s/60.htm. This offer expires on December 4, 2017. ALPI: 40% Discount for ONSITE group classes for ISTQB (FL, AT, Mobile, AL-TM, AL-TA, AL-TTA), HP (UFT, QC, LR), Open Source (Appium, Selenium, JMeter) and Certified Ethical Hacker (CEH). Individual sign-ups for Public classes at www.alpi.com/training. Learn from the Pros! Test Process Improvement since 1993. Contact our Training & Consulting Services team for details at training@alpi.com or by calling (301) 654-9200 ext. 403 to lock in your savings in 2017! ISTQB is a registered trademark of the International Software Testing Qualifications Board.